The site fills me with melancholy when looking back on it now from the vantage point of 2013 after continued decreases in public funding for universities; the Great Recession beginning in 2007; the “privatization” of public universities; the trend toward “accountability” and “assessment” of education; the push by technology-industry leaders, pundits, and politicians for MOOC online courses to take up the slack; and other symptoms of the colonization of higher-education institutions by neoliberal philosophies and management structures native to contemporary business. The Manifesto, its context, and its reception are events of major interest to scholars in such fields as science-technology-and-culture, sociology, journalism, etc. 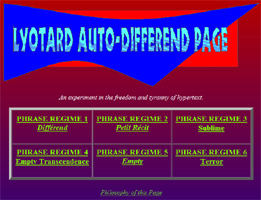 This is all the more so because the distinctly academic style of argumentation and language in the Manifesto (which comes complete with the bomber’s endnotes) establishes an intense feedback loop or “reverb” with the academic institutions whose faculty and staff have been among the bomber’s favorite targets–and casualties. 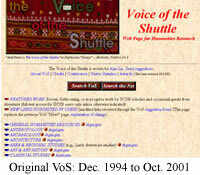 Original, static HTML version of my Voice of the Shuttle: Web Page for Humanities Research. I started VoS in late 1994 as a Web site restricted to my campus (U. California, Santa Barbara), then made it world-accessible on 21 March 1995 as the root site of UCSB’s first humanities server (named humanitas.ucsb.edu at that time). Links were collected primarily using the text-only Lynx browser (for speed over a 2400 baud modem) even though the Mosaic graphical browser had recently appeared. My colleague Victoria Vesna in Art scanned and Photoshopped the logo for me, using a bolt of fabric loaned by my colleague in English Shirley Lim. 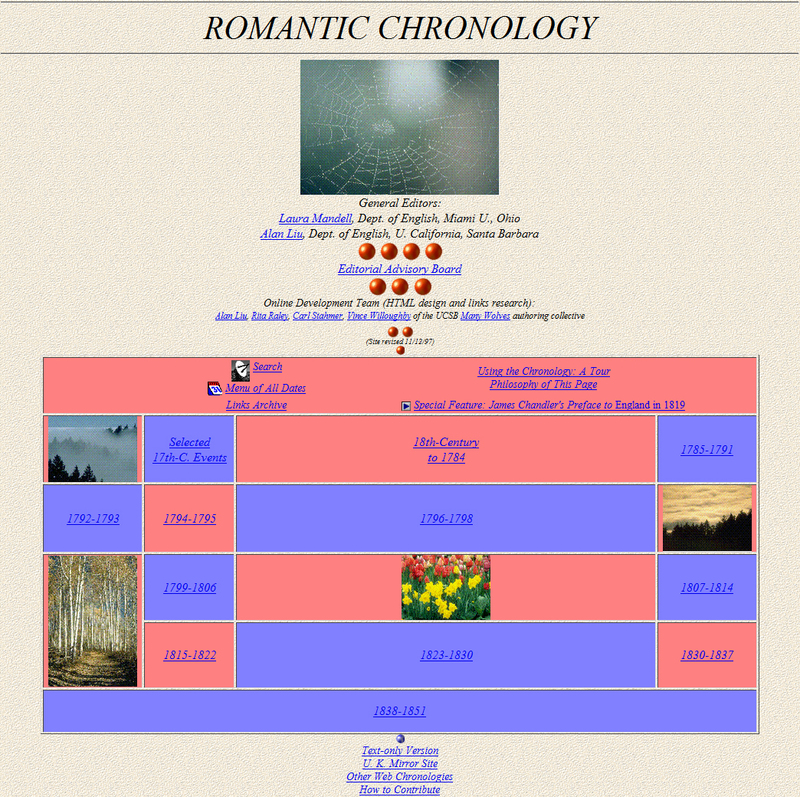 From its origin to October, 1999, VoS stayed at the same address on the Humanitas server. 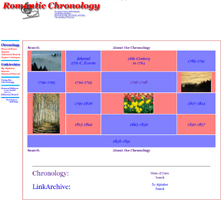 It grew in that period to over 70 pages of links to humanities and humanities-related resources on the Internet. 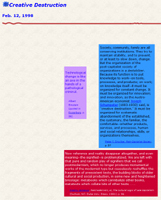 Its mission was to provide a structured and briefly annotated guide to online resources that at once respects the established humanities disciplines in their professional organization and points toward the transformation of those disciplines as they interact with the sciences and social sciences and with new digital media. An essay I published in 1998 narrates the origin and mission of VoS (“Globalizing the Humanities: ‘The Voice of the Shuttle: Web Page for Humanities Research.’” [pdf]). In October 2001, after a year of development work by Jeremy Douglass and Robert Adlington, VoS was rebuilt as a database-to-Web site. A SQL-injection hacker attack on the site a few years later led to extensive further work by Douglass to harden the site. Most of link collection, description, and maintenance was done solo (though for a brief period I had some funding and assistance from graduate students). I gradually slowed in collecting and fixing links for VoS over the years as portals and search engines became more generally used. Work on the site effectively stopped after c. 2009.